Allister is a quite exceptional all round endurance athlete with a top class record on the road, over the country and on the track. He is the current Scottish marathon record holder with his time of 2:09:16 recorded in the London Marathon in 1985 when he was third behind Steve Jones and Charlie Spedding and he won the race in 1990 in 2:10:07. He has never received the credit he deserved for either. Prior to the victory he had finished third, third, sixth and thirteenth in his previous four attempts and yet the pundits, including Athletics Weekly didn’t mention him in their forecast. Before we go on, I’d like to thank Graham MacIndoe for all the photographs used on this page. There are a number of articles and appreciations here with the first being by Colin Youngson who has written about the event on several occasions not least in the book which he co-wrote with Fraser Clyne called ‘A Hardy Breed’ which is a history of the Scottish Marathon Championship. Allister Hutton was the finest all-round Scottish distance runner of his generation. Whereas his great rival Nat Muir was faster over 5000m and often defeated him at cross-country, Hutton was also successful at these events and his range extended to 10,000 metres and road running, especially the half-marathon and marathon distances. On his day, Allister Hutton was the best road runner in Britain. 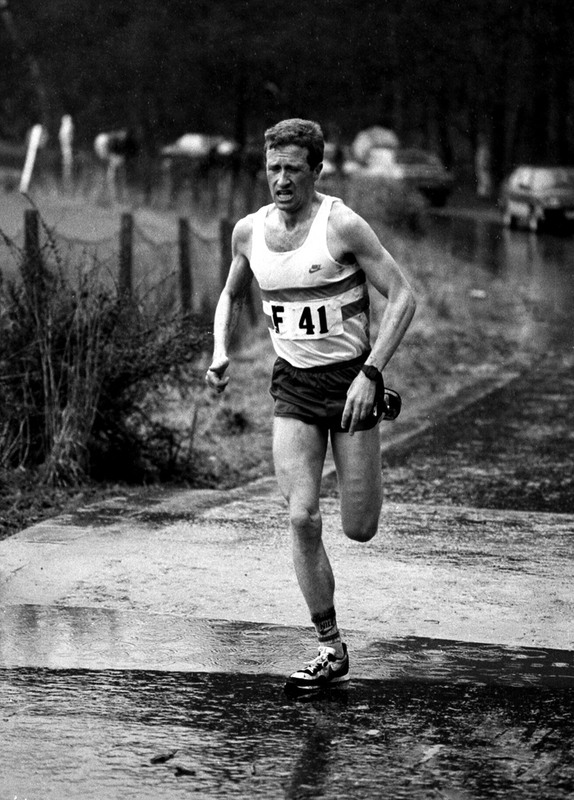 His breakthrough was when, at the age of twenty, he won the Scottish Junior Cross Country title in 1975. More senior member of his club Edinburgh Southern Harriers could only be impressed by Allister’s typically relentless front running. During the next year or two he took part in key training sessions two or three times a week with older runners from several Edinburgh clubs: around The Meadows on Monday nights (sixteen short efforts); the Colinton Circle on Wednesday nights (nine longer repetitions); and on Sunday mornings. The latter was considered the hardest session in Scotland: a long group run from The Meadows, along the canal, through Colinton Dell, out the old railway line to Balerno, back past the reservoirs to Bonaly Tower and eventually a final lap of The Meadows – 25 miles at an unfriendly pace, including hostile surges. International marathon runners forced the pace, but young Allister hung on impassively. Before long he had outpaced his former training companions and was only to be seen zooming along effortlessly, saying nothing but raising one (polite) finger in acknowledgement of other athletes. Hutton’s training was totally dedicated, high-mileage (in fact 110-120 miles per week), and frighteningly fast. Edinburgh Southern won many important team races in the 1970s and 1980s, especially district and national championships on road and country. Although Allister could be an awkward character, calmly refusing to race unless it fitted into his plans, he was the major factor in his club’s success. 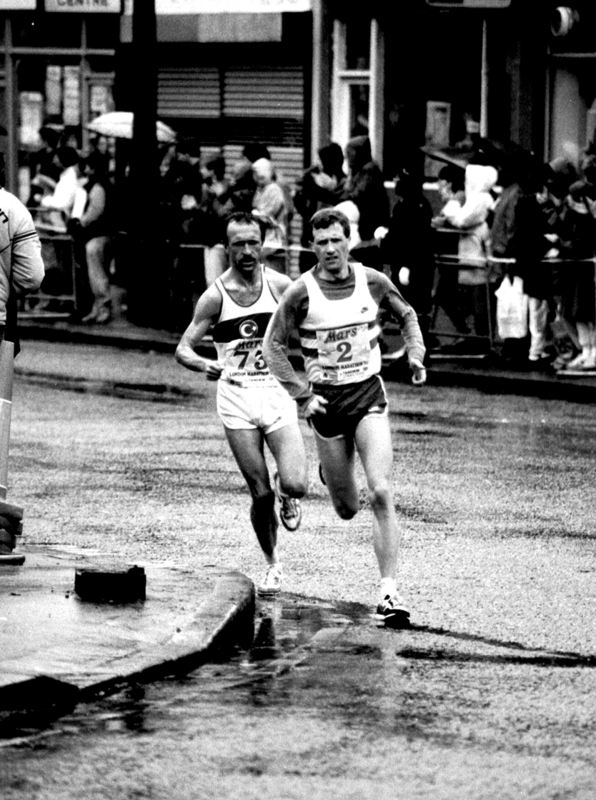 For example, during the first three years of the National Six-Stage Road Relay, he took over on the final stage in second place, well behind a current international runner – the Clyde Valley opponent varied, as did the time gap – first thirty seconds, then a minute and finally one and a half minutes. On each occasion, Hutton’s perpetual motion, seemingly effortless style saw him reel in his rival before overtaking and bowling away to a gold medal and the congratulations of amazed clubmates and frustrated losers. No wonder the rest of the squad considered their finest performance to be when they won the 1977 Edinburgh to Glasgow Road Relay without Hutton! Allister himself remembers as highlights his team almost beating Brendan Foster’s Gateshead Harriers in the AAA 12-Stage Relay; and winning the Pye British Athletics Gold Cup. By the time he was twenty years old, many had suggested to Allister that he was destined to be a marathon runner, due not only to his dedication and toughness, but also his light frame and efficient, balanced, rhythmical style. Typically, Hutton ignored this advice. He was determined to explore his potential at shorter distances to the absolute limit. This he did, improving gradually year after year. At cross-country, he was National Senior Champion in 1978 and 1982; and he had a record ten appearances for Scotland in the IAAF World Championships. At 5000 metres, he recorded his best time, 13.41.45, at the age of 26. Four years earlier he had run 28.13.09 for 10,000 metres at a mere 22 years old; but it took almost another ten years before he finally broke a barrier to record 27.59.12. Thirteen of the top fifty Scottish 10,000 metres performances are his, and this demonstrates Allister’s courage in sticking with a track event reckoned to be gruelling and dispiriting but a true test of pace judgement and character. Of course these were the days before 10k/half marathon road races existed; and track 10ks were available in district, national and U.K. championships as well as the G.R.E. Cup. Eventually, in 1980, Hutton took part in the U.K. Olympic Trial marathon, but was forced to drop out. In 1984, awesome runaway victories in the Morpeth to Newcastle and AAA Half Marathon convinced him to try again. In 1984 he managed 2.16.08 and a good second place to the famous Swede Kjell Erik Stahl in the Oslo Marathon. His training until now was basically for 10k – mainly speed endurance. After a second record-breaking Morpeth win, Alan Storey advised him to switch to two five-week cycles: the first of hard steady miles; and the second including three weekly interval sessions with short recoveries, plus a couple of serious two and a half hour runs. 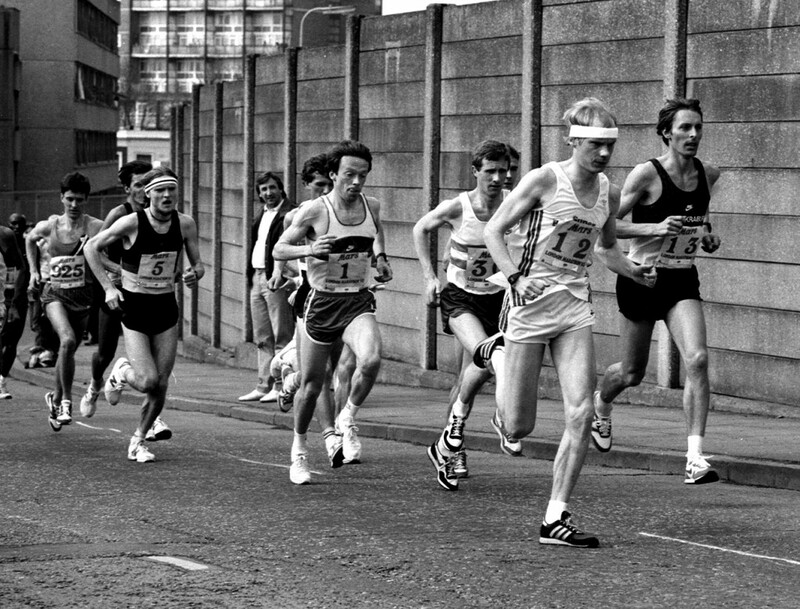 Reaching a peak, in April 1985 Allister Hutton finished third in the London Marathon. His time, 2.09.16, remains at the top of the Scottish All-Time List, and justified completely the years of Spartan concentration on maximising his speed and stamina before switching to the classic distance. 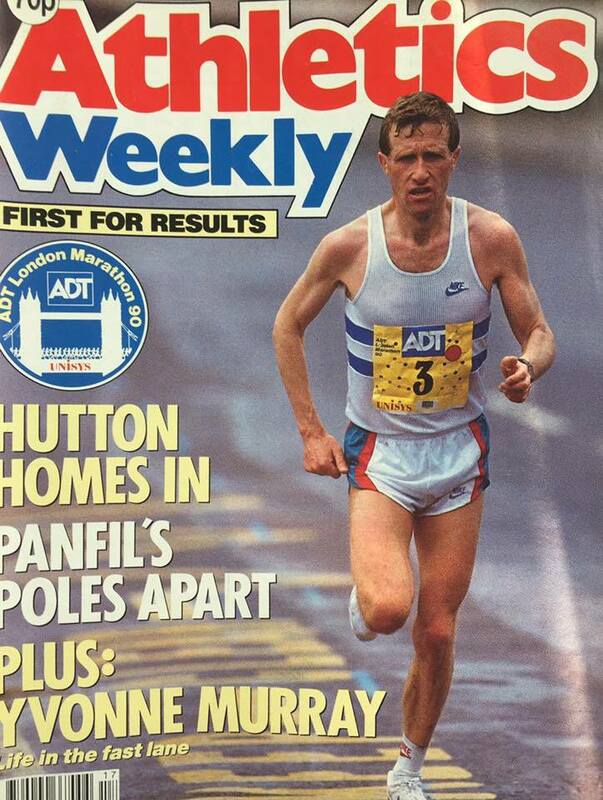 Allister Hutton’s seven best marathon times were all produced at London, apart from a rare foray to Chicago in 1985. He finished only 13 marathons, and almost prefers to remember racing for Britain on the track, taking part in three Commonwealth Games and a European Championship – and defeating World Champion John Treacy in the Gateshead cross-country. Yet arguably the finest performance of his career, a race which ensured his place in the memory of all who watched it on television, was in 1990 in London, when he had reached the ‘advanced’ age of 35. Allister almost missed the start, when the runners’ bus got lost! Then, when the pacemaker Nick Rose dropped out after Tower Bridge, Hutton was left alone in the lead. Assuming that this isolation was foolish, his rivals in the chasing group let him go. By twenty miles this gritty Scot had ground out a lead of at least seventy seconds. After that, the chase began in earnest, as English commentators forecast his doom. Seldom has a sports broadcast seemed so fascinating to Scottish viewers; seldom has time (and distance) taken so long to pass. Yet Allister showed no sign of distress: his style remained controlled and his face composed. However the long, long straight of The Mall seemed an eternity to him – both agony and ecstasy as he lived out the dream of leading such an important event in front of so many rivals and spectators. Eventually he crossed Westminster Bridge first, still twenty seconds ahead, in 2.10.10 – a really dramatic Scottish victory in the English heartland. Jim Alder used to say that young runners needed to serve an apprenticeship – learning from coaches and older, faster clubmates. After some years of constant training, the ‘apprentices’ would mature and qualify as proper athletic tradesmen. Allister Hutton believes that today’s talented youngsters seldom endure such an education, which explains why his own best times remain superior. For years after sporting retirement, he was still to be seen striding out briskly around Edinburgh. However he refused to return to racing – and no one was likely to convince this quiet, steely individual otherwise. This second article is from the lamented ‘Scotland’s Runner’ Magazine and was printed after his victory in the London Marathon in 1990. Scottish athletics administrators would be wrong to think that Allister Hutton’s bold front running ADT London Marathon triumph has taken the edge off his belief that the country’s middle distance and marathon runners are getting a raw deal. On the contrary the indications are that the 35 year old Edinburgh Southern Harrier will use his capital success to promote a rethink at the top. Only a handful of SAAA officials escaped Hutton’s scathing comments as he told ‘Scotland’s Runner’ : “In all the years I’ve been in the sport I’ve always had more encouragement from my club than I’ve had from the governing body.” And the glory of London took a back seat as Scotland’s new running hero used his own pre-Commonwealth Games experience to illustrate his frustration with officialdom. Where, he wondered, was the common courtesy of a reply when he sent a letter indicating that he did not want to run in the marathon in Auckland. “Surely it warranted some sort of response from the SAAA even if it was only to ask why the top man in the event did not want to compete in the event?” said Hutton. “But they didn’t even acknowledge my letter.” On the question of whether he would have been interested in a place in the 10000 metres, Hutton said, “I did indicate that I did not have the qualifying standard for that distance.” But hints, nods and blind horses come into the picture when he highlighted the fact that other countries are never reluctant to nominate an athlete for more than one event – with the choice being left to the individual. “They knew the score,” claimed Hutton as a prelude to his view that the Commonwealth Games standards were way out of line with reality. “A 28:20 for the 10000 was bordering on stupidity,” he added. And he was equally scathing about the 2:13 guideline for a marathon place. “England and Wales don’t demand that kind of standard” said the runner who is one of only five Scots to have returned a sub-2:13 marathon. Only a handful of distance runners in the whole world could have matched up to the Scottish qualifying demands, he added. Scotland’s unrealistic 2:13 guideline also came across when Hutton turned his attention to his automatic selection for Split later this year. “The 2:15 requirement speaks for itself,” said the Edinburgh runner who is determined to reap the benefits of a long rest before turning his attention to Yugoslavia. “There is always a danger of trying to get back too soon,” he said, “As of now, I’m going to take it day-to-day and week-to-week. There is no set plan for the months ahead.” Coach Alan Storey will be one of the first to know Hutton’s thinking on how he should approach the European championships. “But everything is flexible,” emphasised the runner who admitted he will be side-stepping many of the requested personal appearances that will come his way in the wake of the London glory. “People tend to forget how you react to running a marathon. Mentally I’m on a high. Physically, I’m run down and tired. It’s a question of being given time to recover,” said the man whose marathon career began on a low note. But the memories of how he quit after 15 miles of a 1980 race have been buried in the consistency he has shown in London (five times), Chicago (twice), Oslo and New York during the intervening ten years. 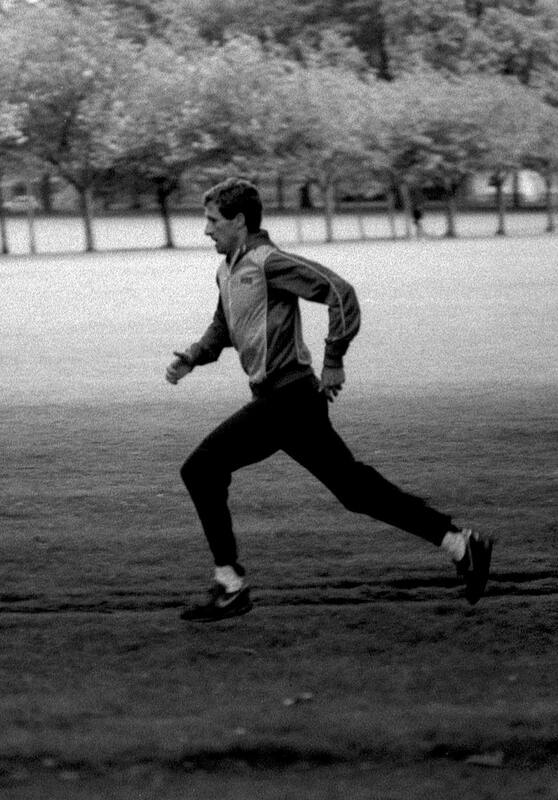 “London has been good for me,” said Hutton in what many will regard as an understatement in view of his 1985 personal best of 2:09:16 and the overdue 1990 triumph of 2:10:10 which ranks the Scot as the fastest Over-35 Briton of all time. In the actual race the top men were wary of each other and ignored Allister as he sped off in front on a very wet and windy day. His winnings totalled £35000 and the first thing he did on return was to contact an accountant “because the Inland Revenue are the real governing body of the sport.” The article from ‘Scotland’s Runner’ talks about Split but unfortunately he didn’t make it. He reckons he was in the form of his life with a 29:10 for a hilly road race but picked up a throat infection and was unable to run. With a Scottish record inside 2:10 and thinking he was in even better shape, what could he have done to the record book?